Annan Ex Club was the venue on Monday 1st April for the final of the 4 Man RSK Team KO, the trophy donated by the Ex Club in memory of the late Robert (Bob) Kirkup. A highly talented and respected player over 5 decades, Robert was well known around the area, excelled at both snooker and billiards, and represented the Ex-Service Club at local, regional and national events. 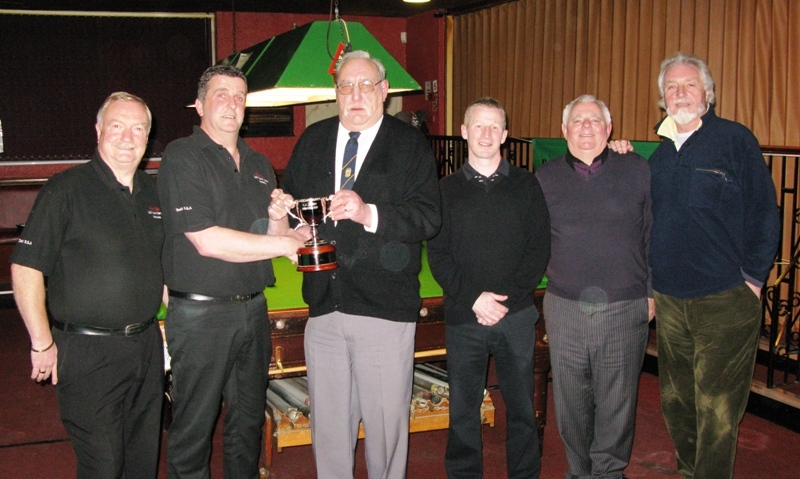 The finalists were Annan Ex, the current holders, and the Albert Club who won the event in 2011. The match was won by the visiting Albert Club who, despite having drawn and lost both their league matches against the Ex this season, outplayed the home side to record a comfortable victory. The Albert Club team (l to r) David Gauld, Ian Wells (Captain), Derek Cannan, Alex Currie and Jim Smith receiving the RSK trophy from Annan Ex Vice Chairman Mick Nelson.